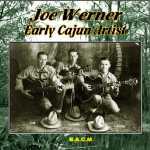 Joe Werner is nowadays largely forgotten but was a talented musician who made some superb music in the 1930s - Joe singing, playing guitar and harmonica - and adding his haunting whistling on several tracks, whilst backed with some of the top Cajun musicians of the era. Our compilation covers the period 1937-38; the music is more ‘Hillbilly with Cajun musicians’ rather than strictly ‘Cajun’– familiar songs and tunes, some sung in English, some French and includes a fine version of Wondering, a song which later became a big hit for Webb Pierce. Refreshing to hear familiar hillbilly classics like Twenty One Years and They Cut Down The Old Pine Tree sung in French!